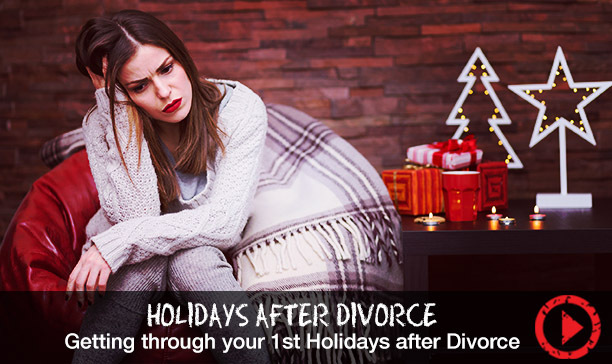 Facing the holidays after a divorce can feel terrifying. This important family rituals mean a lot to our mental health. It's important to remember though that every religion in the world has some kind of festival of lights, because this was a scary time for our ancestors. We didn't know if the sun was coming back or a food was around so we huddled around fires with people we loved. So it's okay in the holidays to feel sad. You don't have to have forced joy. But it's also important not to wallow in it, so I've got a few tips for you. The holidays are going to happen. Your ability to huddle with people around fires are going to happen. It may not happen on the day that you've planned, because maybe your kids will be with the exes, but you can find another day in the holiday calendar to make it your own. And it may not happen with the people you normally have it with. You know, Dr. Freud mentioned a really healthy defense against emotional pain. He calls it sublimation. Sublimation is when you take your pain and you focus it on somebody who's experiencing the same pain, and you console and give to them. So why don't you make a holiday table this year. If you start asking around, you're going to find there are lots of misfit, extra people around who don't have family and you can give to them in the same way you're consoling yourself at the same time.